Yesterday, the New Zealand Under 18 boys made history and won for the first time the Youth Oceania Championships. The team, led by Coach Tim Rayner and Coach Jack Gallagher (Vikings), went undefeated in the competition and were very dominant in each game. In the team were four Vikings players, Paul Ireland, Miguel Aizpuru, Angus Hazelton and Will O’Connor, who all provided crucial for the team on the way to the title. Congratulations to the team, the coaches and all the supporters who helped in achieving this massive milestone for New Zealand Handball. At the same time, the Junior Oceania Championship happened at the same venue. 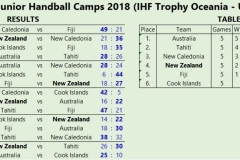 In the junior competition, the New Zealand team played an excellent tournament but fell just outside of the medal ranks and brought home a 4th place. The team was coached by Viking’s Luke Ireland and had five Vikings players in the line-up – Alex Bickers, Riley Grice, Jared Peterson, Cassius Papera-Lewin and PJ Garner. The team managed to win 2 out of the 5 games with close defeats to the winner (Australia) and 2nd placed team (Tahiti). Well Done boys! Last Sunday was the second game day of the 2018 season. 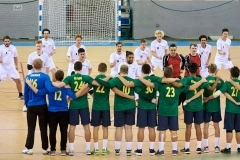 The games for both Vikings men were postponed due to the majority of players being on tour with the New Zealand National Teams (Youth and Junior) attending the Oceania Championships in New Caledonia. Though the Vikings women team played and faced the Hutt Valley Hunters. Last time both teams met was at last years semi-finals which the Vikings won. On Sunday the outcome was different and the Hunters won. Unfortunately, due to absence and injury, the Vikings had only 5 players for the game. All 5 players played their heard out and fought all game but playing against a team with 2 players more on the pitch is almost a situation that can’t end with a win. 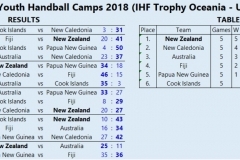 In only two weeks, the NZHF will participate at a new version of the IHF Trophy, also functioning as the Oceania Junior and Youth Championships, played in New Caledonia. Between the 10th and the 15th of June, various Oceania teams will play for the Oceania Championships. The winner will qualify for the IHF Trophy World final but also for the Youth World Championships or respectively the Junior World Championships. The New Zealand Handball Federation has recently announced the teams, and we are proud that a few Vikings players have successfully trialled and made the team. Congratulations to everyone and good luck for all of you at the tournament. Make us proud! The indoor season is coming soon to an end. After last weekend’s NZ Club Championships, tonight were the semi finals of the Wellington League. The Vikings women faced off versus the Hutt Valley Hunters to battle out the second finalist for the Wellington League final. The Vikings women started good into the game and build an early lead (3:1, 6:2, 9:4), though half way through the first half, the Hunters woke up and started fighting back (18:12). The second half saw early on two equal teams battling for the spot in the final. The Vikings women left lots of scoring opportunities unused and though the Hunters fought back and the Vikings lead started melting slowly thinner (28:24, 30:27, 32:30), but then in the last ten minutes of the game our goalie Michaela saved ball after ball and secured the team’s win and spot in the final. Final score 36:31. The Vikings Danes team faced the Vic Uni Turtles in the semi final and it was a game that saw two completely different halves. The first half was a bit of a shock to the Vikings. The Turtles came prepared and put the Danes under pressure, creating numerous scoring opportunities and exploiting holes in the Vikings defense. On the other side, the Vikings attack suffered from inaccuracy and too much individual play, instead of the team play the team is known for. At halftime the Turtles led surprisingly 17:18 and the Vikings needed a wake up call during the half time break. The second half started then with a very concentrated Vikings defense and a clinical Vikings attack. The defense forced turnovers and the fast break led to easy goals on the other side (24:20, 29:22). At the end, the Vikings cruised home to a 37:28 win, securing a spot in the final.